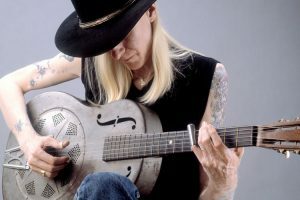 New York, NY – On September 30 and October 1 at Gibson Brands NYC Showroom (formerly the iconic Hit Factory recording studio on West 54th Street), Guernsey’s will be conducting a major auction of the complete Johnny Winter Collection. Coming directly from the late, great blues/rock musician’s family, the auction will consist of more than thirty guitars (including Johnny’s six legendary Gibson Firebirds, his three Lazers, the very first guitar he ever played as well as his very last, several rare metal resonators and other early, beautiful instruments. The more than 600 auction lots will also include his stage-worn clothing and gear, and personal items of every description, from Johnny’s Beaumont, Texas high school ring to his clipped beard! We’ll also be selling several exciting notebooks filled with Johnny’s handwritten music he composed in the late 60s and 70s. There will also be many rare posters and photographs featuring not only Johnny but also several other legendary musicians that he performed with, including Muddy Waters, Eric Clapton and Jimi Hendrix. Speaking of Jimi, the event will also include one of his stage-worn shirts, as well as three exciting original works of art that Hendrix created. Fans and collectors should know that this will be an unreserved auction (an auction without pre-set minimum prices) making for the exciting kind of event you know Johnny would have loved. Obviously, all are encouraged to attend what is certain to be a wild and crazy event live at Gibson’s Showroom, but for those unable to be there in person, absentee bidding can easily be arranged by telephone and online at liveauctioners, or invaluable. For a sneak preview of the items being offered in this collection, download a copy of the digital booklet. You may also request a printed copy, which will be available on a limited basis, by calling or email at your convenience. For additional information and/or to get the auction’s printed program, please contact Guernsey’s, 212-794-2280 or johnnywinter@guernseys.com.